(CNN) -- A second person has died during construction for Madonna's upcoming concerts in Marseilles, France, authorities said Friday. 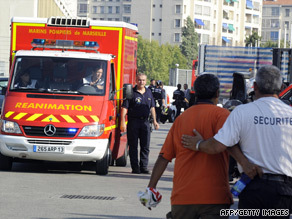 Firefighters leave the Stade Velodrome stadium in Marseille after the accident on Thursday. The second fatality was a 32-year-old British citizen, the British Foreign Office and a high-ranking police official said. It was not clear whether the person was a man or woman, but the next of kin had been informed, the Foreign Office said. A 53-year-old French man was killed Thursday when a crane collapsed at the venue, a fire department spokesman in the southern French city said. A third person was in critical condition, said Alexandre Lanzalavi, a spokesman for Marseille Hospital. Two other people were in hospital and required surgery, and seven others were treated and released, Lanzalavi said. Madonna said Thursday that she was "devastated" to hear about the death. "My prayers go out to those who were injured and their families, along with my deepest sympathy to all those affected by this heartbreaking news," Madonna said in a statement issued by her representative, Liz Rosenberg. At least one Madonna show had been canceled, Rosenberg told CNN. The accident happened when a crane collapsed while lifting a large metallic truss -- a structure from which lights hang -- into place, Lt. Thierry Delorme of the French Navy told CNN. In Marseille, the fire department is a part of the Navy. An investigation has been launched into the cause of the collapse, he said. Some 27 fire engines and 80 firefighters responded to the emergency when the accident occurred about 5:15 p.m. (11:15 a.m. ET). Madonna was to play the first of five concerts for her "Sticky and Sweet" tour at the 60,000-seat Stade Velodrome on Sunday. The singer was in Udine, Italy, when she heard the news, Rosenberg said. Flora Genoux in Paris, France, contributed to this story for CNN.